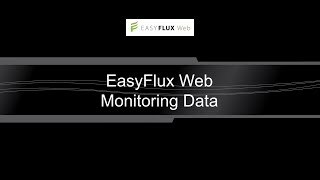 EasyFlux™ Web CSI-Hosted is a web-based software tool for monitoring CR6- and CR3000-based Campbell Scientific, Inc., eddy-covariance systems. EasyFlux™ Web CSI-Hosted is hosted on Campbell Scientific's own Microsoft Azure server, which allows for automatic updates and maintenance of the software. After users create an account, they are given their own IP address to allow them to easily connect to their data from an Internet-connected device. Monitoring a network of eddy-covariance systems is made easy with real-time data monitoring, customizable alerts, and data download capabilities. EasyFlux™ Web is compatible with open- and closed-path eddy-covariance systems. 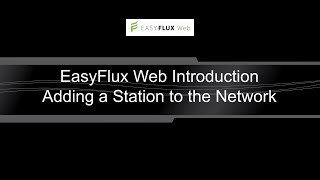 EasyFlux™ Web is a web-based multi-user software system used for monitoring Internet-connected Campbell Scientific eddy-covariance stations. EasyFlux™ Web functions with a Campbell Scientific CR6 Measurement and Control Datalogger running either the EasyFlux-CR6OP program for open-path eddy-covariance systems or the EasyFlux-CR6CP program for closed-path eddy-covariance systems, or with a CR3000 Micrologger® running the EasyFlux™ DL program for open-path eddy-covariance systems. When a station is added, EasyFlux™ Web automatically pulls station information available from the program running in the datalogger (ecosystem, latitude, and longitude). After adding your stations, you can graphically monitor data including QA/QC values, download data, compare data between stations, and set up alerts to notify you by email of data values outside of user-entered thresholds. An administrator can set up user accounts and control the permissions of each user. EasyFlux™ Web Campbell Scientific, Inc.-Hosted: Campbell Scientific can install the software and automatically update it for you in an Azure-based environment, as well as provide you with a link to access the software. EasyFlux™ Web Self-Hosted: You can install the software directly on your server. When installing the software on your server, the installation process will also install SQL Server Express. 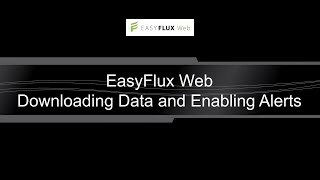 EasyFlux™ Web is then accessed by typing the IP address of the server into a web browser.